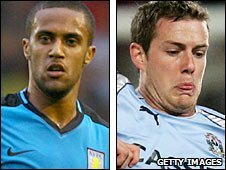 QPR have signed Aston Villa winger Wayne Routledge and Coventry City defender Gary Borrowdale. Routledge and Borrowdale, both 23, have each penned three-and-a-half year deals for undisclosed fees. "I'm absolutely thrilled to be here," Routledge told the club's official website. "I am delighted to have sealed the move." "QPR are a club with huge ambitions and as soon as they showed interest in me I was determined to speak to them." Routledge added: "The manager has a great vision about where he wants to take the club and he sees me playing a big part in that. "It's nice coming back to London, but the geography didn't play a big part in my decision- the reason I am here is because the manager showed an unbelievable desire to get me to QPR." Routledge, who has also played for England Under-21s, started his career at Crystal Palace. The Kent-born winger made his debut for the club at the age of 16 in October 2001 in a 1-0 home defeat against West Bromwich Albion. He made his first start, aged 17, against Wolverhampton Wanderers and scored after just one minute on the pitch and also played a part in the side which won promotion to the Premier League via the play-offs in 2003-04. In 2005 he joined Tottenham, during which time he also spent loan-spells away at Portsmouth and Fulham before joining Aston Villa in January 2008. He also had a recent spell at fellow Championship side Cardiff City in 2008. Routledge will wear the number seven shirt and is set to be unveiled before Saturday's FA Cup tie against Burnley. Meanwhile, Borrowdale joined the R's on loan in late November but has failed to feature for the first team. He joined Coventry City in July 2007 from Crystal Palace and also spent time on loan at Colchester earlier this season.